Do you have kids that are excited about Finding Dory and are ready to learn more about the different creatures that live in the oceans? Summer means trips to the aquarium, the beach and, of course, Disney Pixar's Finding Dory! Nat Geo Kids Books debuted two titles that encourage kids to "dive in" and learn all about the REAL characters from the hit blockbuster. 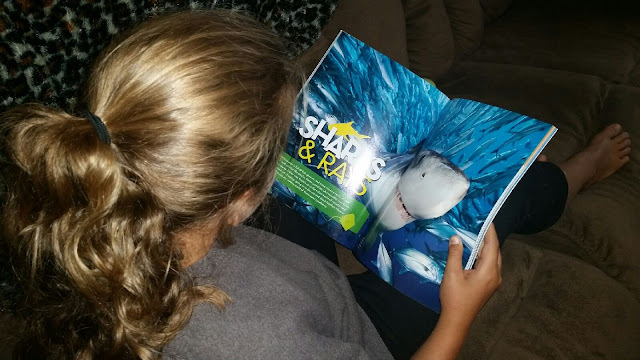 My daughter (age 12) is obsessed with sharks and was thrilled to find the section "Sharks & Rays. There aren't many shark facts that she doesn't know, but she is always eager to learn more! I've always encouraged my children to look at books and read, even when they were toddlers. Books let their imaginations run free and take them to places unknown. Books also fill their minds with knowledge and facts that will fuel them for life! Ocean Animals: Who's Who in the Deep Blue ($12.99, ages 8-12) is an oversized book and it needs to be! Featuring huge, stunning underwater photographs this book covers it all -- from life in coral reefs to sharks and rays, to bizarre creatures of the deep and even sea birds -- and all the favorites from Finding Dory including, sea lions, octopus, beluga whales, whale sharks and of course clown fish and Dory herself -- blue tangs! Ocean Animals Sticker Activity Book (ages 4-8, $6.99) has over 1,000 cool stickers of the most popular, adorable, ferocious and weird ocean animals, like dolphins, coral, fish, sea turtles, seals and more. Also included are skill-building puzzles and mazes, spelling and pattern games, drawing, photos, facts, and other activities that will keep kids you entertained (and learning) for hours on end. Perfect for road trips and plane rides! These books are AMAZING! They are bright, colorful, and full of great information. The activity book promotes exploration, creativity and imagination - making it the perfect for summer outdoor fun. Whether you're at home, exploring the park or sitting on the beach... these are the perfect companions for your children. Natural Geographic is offering ONE lucky Being Frugal and Making it Work reader an "Dive Into Summer" Prize Pack that includes one copy of Ocean Animals: Who's Who in the Deep Blue, one copy of Ocean Animals Sticker Activity Book and a Dory plushie (ARV $30)! This giveaway will end August 31st at Midnight EST. 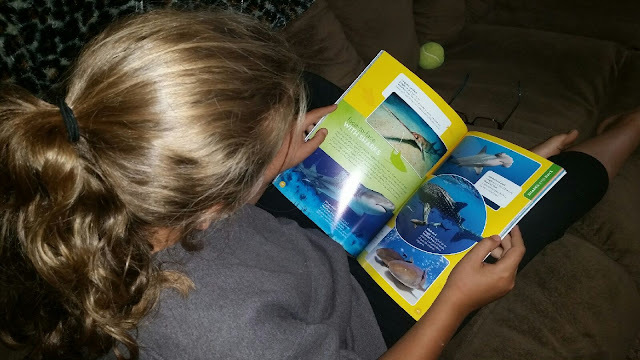 Disclaimer: The Being Frugal and Making it Work family received a complimentary National Geographic Kids "Dive Into Summer" Prize Pack for the purpose of writing a review and hosting a giveaway. Regardless, I only recommend products or services I would use personally and/or believe will be a good fit for my readers. The views and opinions expressed on this blog are based purely by our own experiences. No monetary compensation was received. Results may vary. Nice prize package. I think I would give this to my youngest son. He would enjoy it the most. I would give the National Geographic Kids prize pack to my grandson. He would enjoy reading these. I would give these books to my kids. They love National Geographic publications because of the great pictures. I would give this to my daughter. She loves reading about animals so she would enjoy the ocean animals theme. I would give it to kids. They love National Geographic books. They would be all over it. Lots to learn when reading National Geographic Books. If I won I would give this to my twins. They are obsessed with all things animal and would love this! If I were lucky enough to win this book prize pack, I would give it to my middle son. He wants to be a shark scientist, and he is crazy about the ocean. It would make a great Christmas gift. I would give this National Geographic Kids prize pack to my son. He loves to learn about animals and habitats.